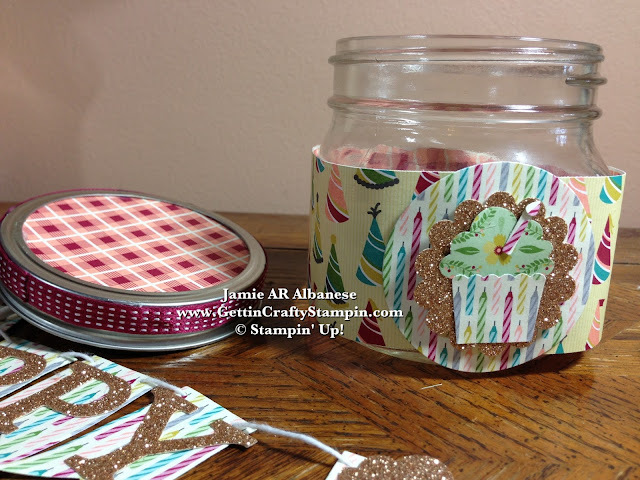 Getting Crafty with Jamie: Birthday in a Jar! 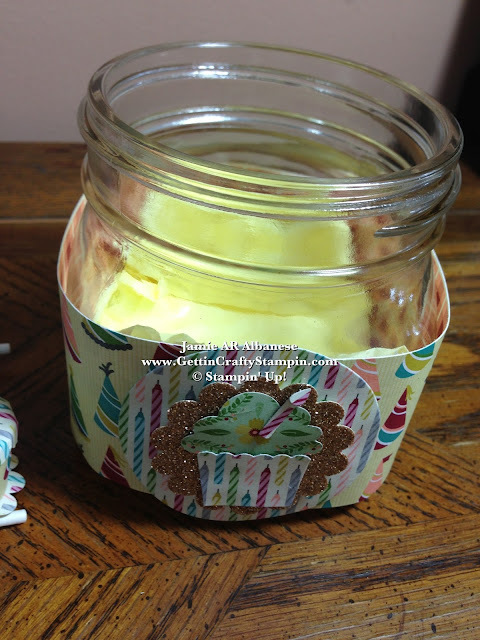 I purchased these sweet Ball Mason Jars and knew I'd want to craft with it... but they've sat around for a month! 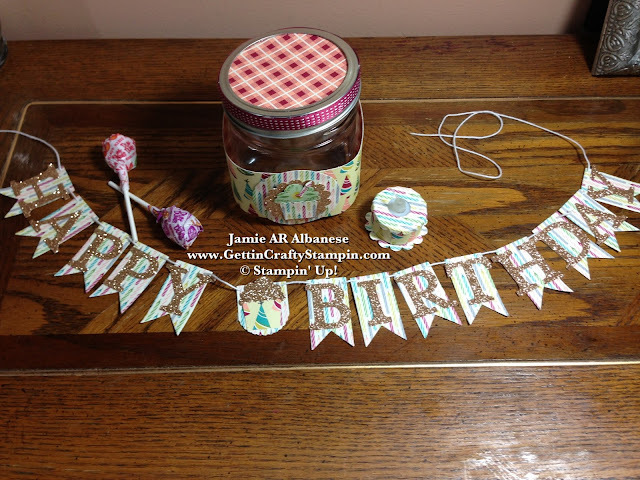 So I decided, after an inspirational conversation with a stamper and friend, Carol, to create a Birthday jar.... with this Birthday Basics Designer Series Paper (she couldn't see herself owning this packet... lol... so I'm here to inspire!). 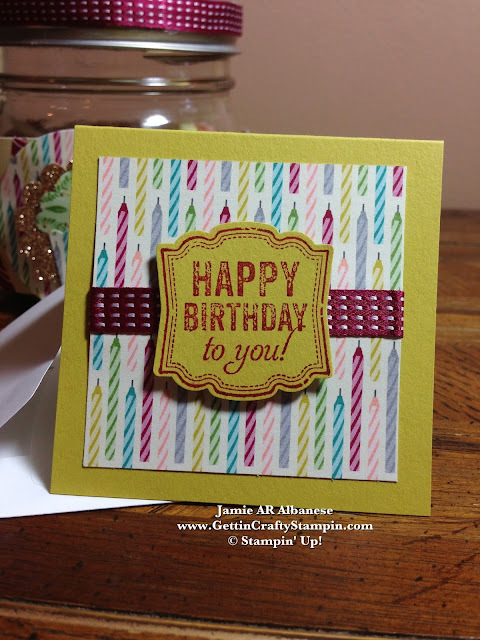 Birthday Basics Designer Series Paper (#130145) is a vintage themed birthday celebration! 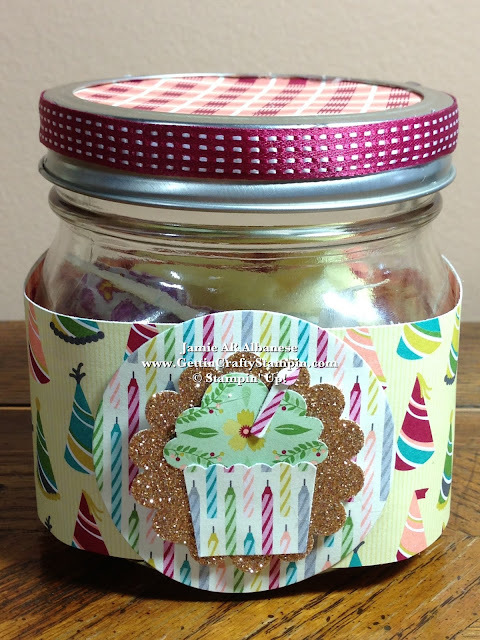 Rich colors, fun theme... it's pretty universal and this Jar is perfect for so many - from a gift for your friend, neighbor, co-worker... this is a safe and fun way to celebrate! 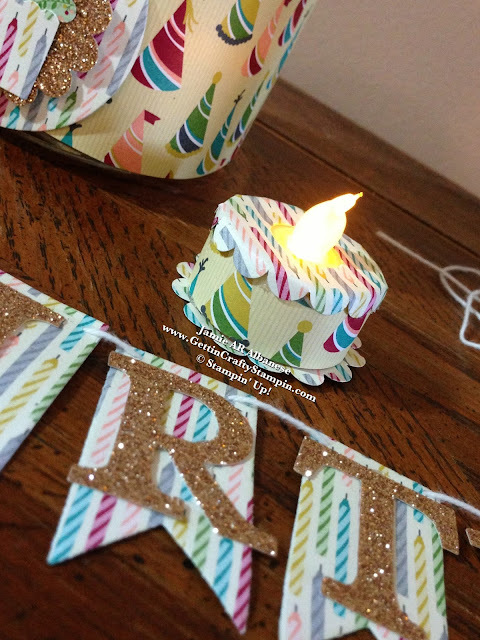 Hot glue is my best friend with this project... here it adheres this Designer Series Paper. Lining it with some gift bag tissue allows for a colorful cushion! 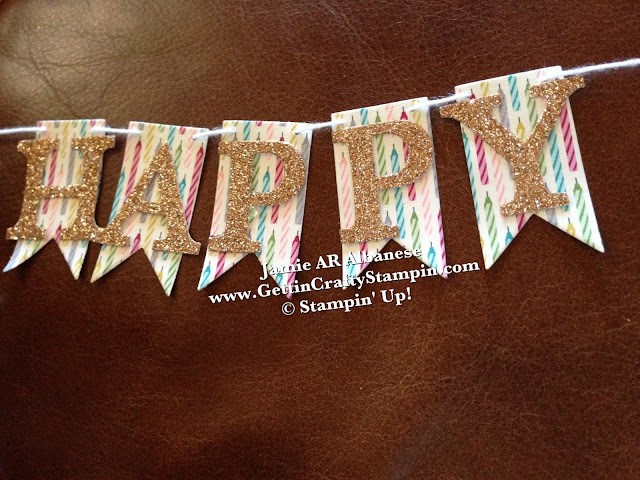 My Big Shot (#113439) and the Hearts a Flutter (#130159) Framelits have the cutest mini banner pieces (under 2" tall!!)! 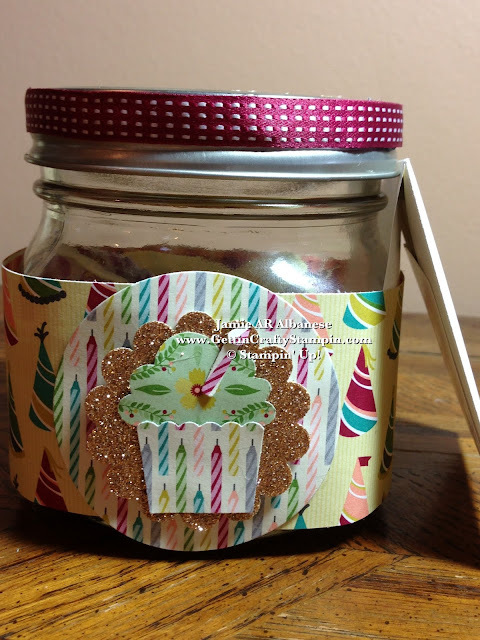 It is perfect for the Birthday in a Jar as it's small and can decorate an office, cubical, above a table or door way. Our Typeset Alphabet Bigz Dies (#127553) allow me to punch out any words I want and from a ton of different materials - here I used the Champagne Glimmer Paper (#127885) to vibe with the vintage feel of this paper. How cute is this Happy?? It's classic, elegant and timeless while being FUN! I'm sure it'll be used again and again - or even re-gifted!! Scraps... they really can have a new life with the aide of our punches!! 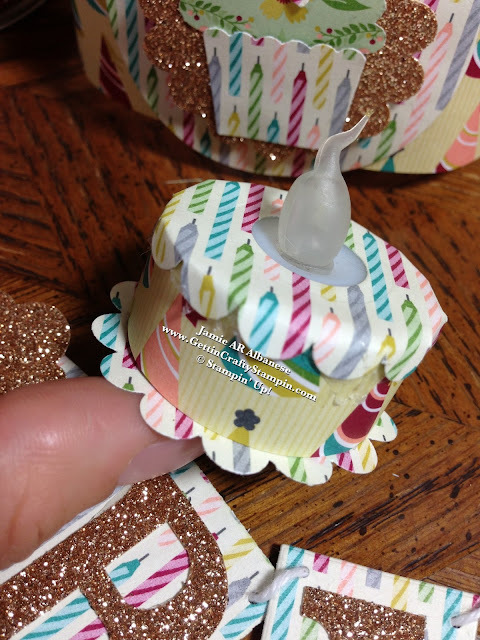 Here this Cupcake Builder Punch (#121807) and our scraps for a 'break' in the words. 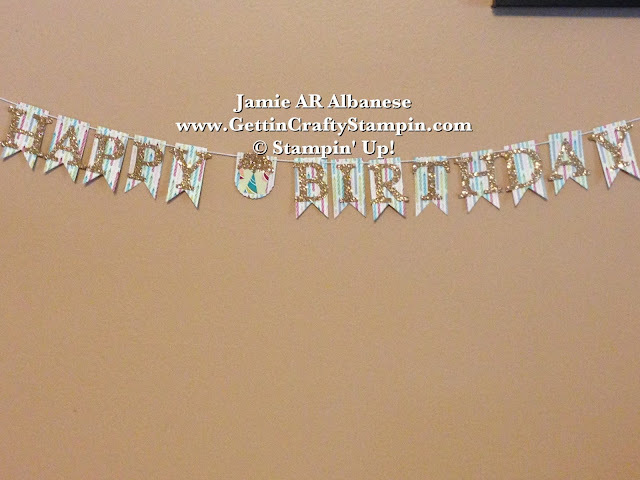 Our Whisper White Baker's Twine (#124262) is ideal for this little banner! 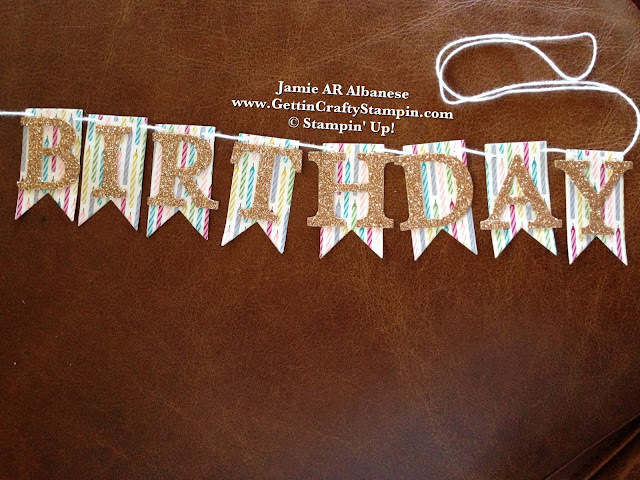 Sparkly Birthday... it's sure to bring some Joy and Sparkle to someone's special day!! Awwwww - come on, that is sooo cute! 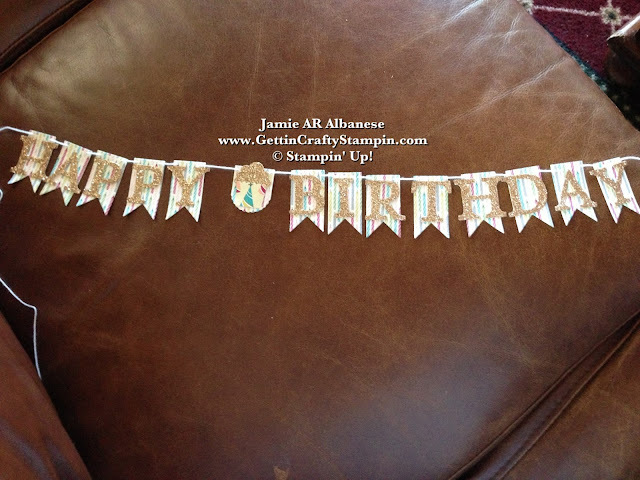 This banner will fold up upon it's self and the twine will wrap it up to hold it together! Creating a safe and little calorie-free birthday cake is sure to light up the special day (with no fear of burning the place down!). Our 1-3/4" Scallop Circle Punch creates the base and the topping of this cake - the candle print on the paper is soooo cute!! The NEW Circles Collection Framelits allow me to cut the center of this scallop punched topper so the 'flame' can pop through! They helped create the top of the jar, too!! I'm LOVING this new tool and it's perfect for my favorite tool - the Big Shot (#113439). The front circle, the top of the lid, and the top of the Birthday 'cake' all use the New Circle Framelits!! Our Papers, Inks, Accessories and Ribbons all Tie together - making it easy to look amazing when crafting!! 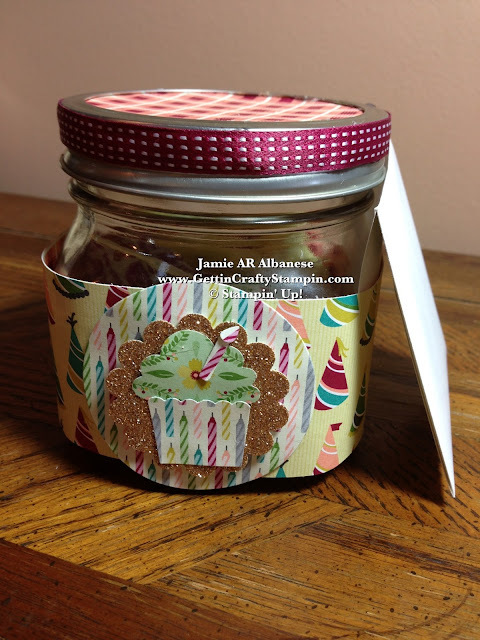 This Stitched Satin Raspberry Ripple ribbon (#126845) looks just amazing on this jar! 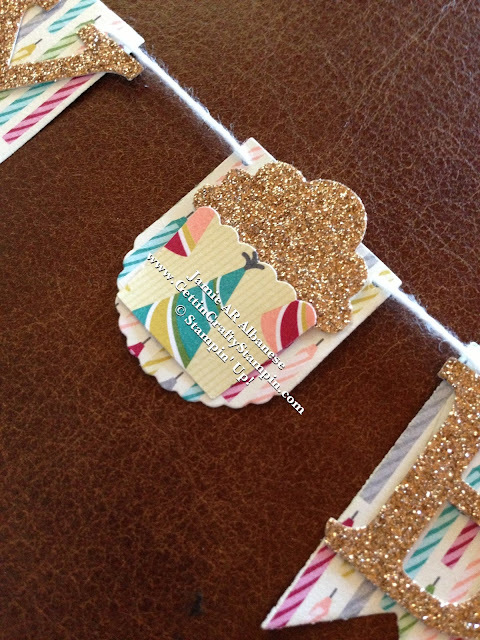 Making a sweet 3"x3" coordinating card makes it easy to show some Love... some Label Love!! This Label Love (#130622) New Stamp Set and coordinating Artisan Label Punch (#130920) make it easy to pop out a sweet card! Our Summer Starfruit card stock (#126839) stamped with our Raspberry Ripple ink (#126859) coordinates perfectly with this Birthday Basics Designer Series Paper! It's Small and Mini is soooo trendy (it's always been a favorite of mine!) and quite a BIG WOW for a Sweet Little Package! Sweetening the little package with some candy, a gift card... there are many options that can be added to this!! My husband's office has many cubicles and offices. They are allowed to decorate but not excessively. This is a perfect package for that setting - with no fear of fire, lol!! I know many a friend who would love this and it's ideal to mail to my family and friends who live far away!! Whether you Celebrate BIG or Small... Celebrating is the Key! Honoring one-another and making someone feel special is easy with just a little effort! 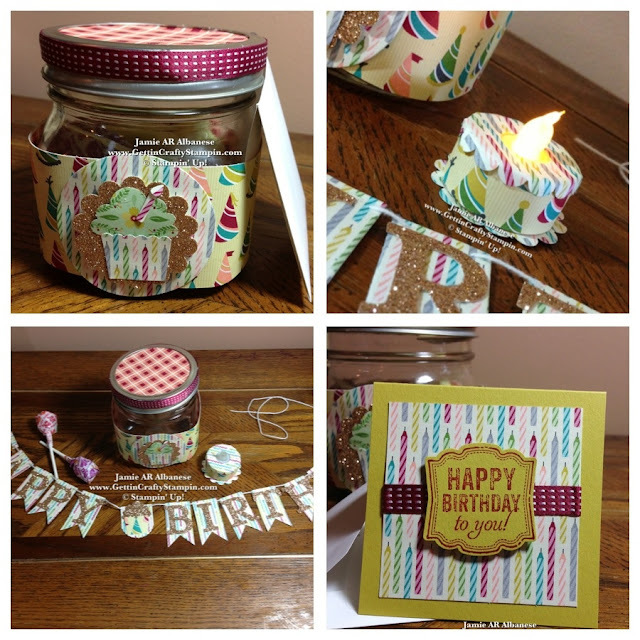 Birthday in a Jar... How do YOU Celebrate? Who would YOU Give this to?? Leave me a comment and let me know!! Please, Share this and me with others! Pin it, Email, Facebook, Tweet, Instagram, and more... I'd truly appreciate it! Join me in this fun Craftin' Walk we call life... inspiration is everywhere! !